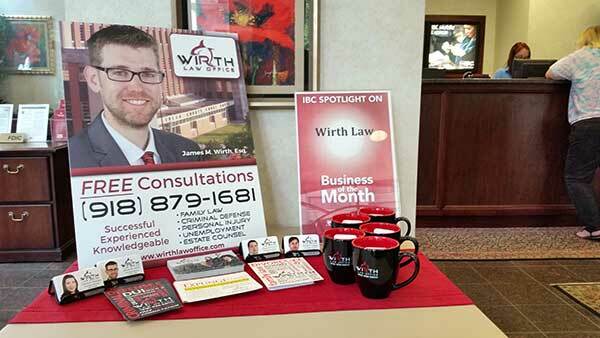 IBC Bank at 4th and Main St. in Tulsa picked Wirth Law Office to be the featured business of the month for August, 2015. If you happen to be in downtown Tulsa during the month of August, stop by the bank to pick up a postcard detailing some of our practice areas along with an elegant black-and-red coffee mug featuring the distinctive Wirth Law Office logo. The coffee cups are free, while supplies last. Of course, Wirth Law Office is best known for our free legal consultations, but what better way to let your friends know where to get good legal answers – free – than sipping from a cup that displays the Wirth Law Office logo and phone number. 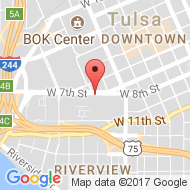 Our postcards are also a great way to let your friends know where to find a good attorney in Tulsa, Ok when they need one. You can find post cards at the bank in August and always in our lobby at 500 W. 7th St., Tulsa, featuring our Tulsa criminal defense attorneys, our Tulsa divorce lawyers, our Oklahoma expungment attorneys and our Oklahoma injury attorneys in front of the renowned BOK center. Who cares who your attorney is, you might ask. Usually, nobody – except maybe someone on the other side in your legal case. At least not until they need a lawyer. Then, you become the one “in the know” when can you tell a friend in need where to find great legal representation at an affordable cost. 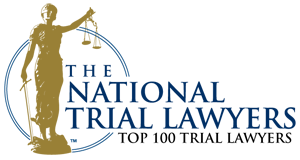 You can tell them in absolute confidence that the Tulsa attorneys at Wirth Law Office offer free consultations so your friend can learn what Wirth Law could do for them – before they ante up one penny for legal representation. And by the way, if you visit the bank for a free coffee cup after supplies are gone, stop by our office on the fourth floor of 201 W. Fifth Street. We will gladly share a coffee cup and any material you might need to tell your friends where you found a great attorney in Tulsa. If you only want a free consultation, or your friend needs some legal information, call us right away at (918) 879-1681. You can also send us questions using the form at the top of this page.